DIVISION OF FLORIDA CONDOMINIUMS, TIMESHARES, AND MOBILE HOMES: PRETTY USELESS! 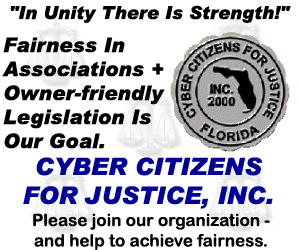 Yes, Florida’s community associations desperately need a regulatory agency with strong enforcement power – but the Division of Florida Condominiums, Timeshares, and Mobile Homes is not it. This Division is another government agency that only serves the purpose of employees getting their pay check – with no use for the people (condo-owners) who are paying for it. Over the years we have seen many decisions made by this agency that are either false, create “laws” that don’t exist or interpret things the wrong way. The people in charge of the Division have obviously “power” problems – and they clearly fail to understand that it’s the Florida legislature that enacts the laws – laws the Division is supposed to enforce – not to add non-existing language to the statutes. The latest example of their total incompetence: Their “interpretation” of the statutes [FS 718.112(2)(l)] regarding the retrofitting of sprinkler-systems in condominiums. Why trying to force somebody to opt-out of something they don’t have to do in the first place? Some of the decisions made by the Division leadership – and employees – have caused havoc among the owners – and even financial hardship. But that happens if you pay low wages: You get only the “talent” nobody else wants – and you get decisions that make no sense. When Division Chief Michael Cochran retired and was replaced by Kevin Stanfield I was happy because I was under the – obviously wrong – impression that a knowledgeable guy took office – a person that had attended many town-hall meetings and had heard the endless complaints of the condo-owners. Boy was I wrong! Instead of taking a turn to the better, the Division took a turn to the worse – and there seems to be no end to the downfall! Since many years I have pleaded with Florida’s legislators to increase the salaries of the Division employees in order to attract better talent. The money is there – paid for by the condo-owners into the Condo Trust fund. But it’s obvious that our legislators rather spent the money on some frivolous issues instead of the purpose it was intended for. And that is the reason why condo-owners face the disaster of being “regulated” by a Division with totally incompetent leadership.